We are in the throes of the cold and flu season. The good news is that as the temperature rises with the onset of spring, we begin to see fewer and fewer cases of those dreaded illnesses that spoil not just our health but also our outlook on life. Rudeness shares many of the same effects as the cold and flu season. It makes us and those around us miserable. Regrettably, day-to-day rudeness will still be there after the cold and flu season to make everyone’s life uncomfortable. We’ve all been in situations where someone’s rudeness disrupts the flow of our daily activity and discourse to the point that we’d rather be elsewhere. A 2016 study conducted by the Journal of Applied Psychology found that like the common cold, rudeness is easily contracted. Exposure to just one episode can lead to lasting effects, not just to the individual targeted, but to others who may witness and suffer the impacts as well. We now know that bullying is a learned behaviour and that bullies have often been victims themselves. Same goes for rudeness and uncivil behaviour. You can’t catch a cold through the internet (Thank God). Unless of course, you’re using a contaminated keyboard. However, the relentless diatribe spewing from media trolls and fake news has contaminated life on the web. Social media is becoming anything but social, filled with hate and resentment, and a breeding ground for the maladjusted in society. Unfortunately, we are becoming a less civil society, with many quick to look for scapegoats to blame for their grievances – real or imagined. Anonymity stealthily allows hatred, racism, personal slurs and insults to flourish online. In fact, disrespect and hate not only poisons our experiences online, but it also teaches others to do the same. It’s just the price we pay to enjoy freedom of speech...Not so. It’s not coincidental that the word civility comes from the word civilization. In fact, it’s part of the glue that makes civilization possible. Civility is not just about politeness, although important, the key is how we can disagree with each other without disrespect. 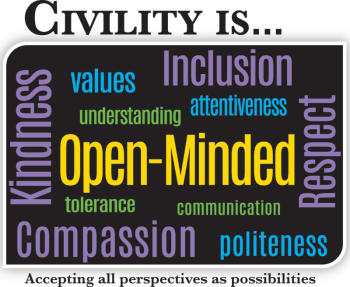 “Civility is claiming and caring for one’s identity, needs and beliefs without degrading someone else’s in the process,” Tomas Spath and Cassandra Dahnke, Founders, Institute for Civility in Government. Getting back to the cold and flu analogy, if neglected, a cold or flu could lead to chronic health conditions. The same goes with the status of our civil discourse. Like road rage - also a sign of declining civility - it often leads to unsafe roads and violence. The decline of civility in our lives diminishes our capacity for seeking common good. We know that volunteerism is in decline. Wonder why? To borrow somewhat from a common saying, Civility may be the chicken soup for society’s cold. The role of a citizen embodies a shared responsibility toward others and not a systemic distrust of strangers. Courtesy and respect encourages social interaction and invites participation and contribution from many. By definition, civility is a key ingredient of a vibrant and progressive society that grows by addition and not subtraction. If we retreat and only engage with those we share common cause, background, race or religion with, we risk turning back the clock, not to the “good old days” as many yearn, but to a darker time in history, when injustice, ignorance, repression and fear prevailed.